When time came to carve the block that would produce Dreadnought (31st of the 41 Maiden Collection sculptures) I had enjoyed quite sufficient time to gain a clear picture of just how I was going to work it. I knew I wanted to utilize the unusual and perfectly preserved granite formation on the crown, and the appearance of waterline markings along its lengths soon convinced me another ship shape was on the way. But it was the battleship grey of the intrusions that brought about the proud aggressive bow and stern of a navy ship. ‘Dreadnought’ surfaced as a name as I’ve always thought it a wonderfully defiant statement with which to take with one across the perilous waves. I carved Dreadnought at a time when I was becoming uncomfortably aware that the once seemingly endless supply of blocks split from the huge slab of Colorado Yule Marble was rapidly dwindling. Having encountered some early difficulties in carving the hard-as-iron bands of magma (granite) intrusions, that give the Maiden Collection its distinctive swirling patterns and designs, I originally approached the gleaming mass of gray with some trepidation, but over the course of carving the previous 30 pieces I had come to not only respect the gray stuff but to admire its incredible resilience, and the rugged quality it imbues. In the weeks following Dreadnought’s completion I would continue to develop and explore the theme of leaving the rough broken battleship gray rock exposed, allowing it to stand in stark contrast to the smooth white of the marble. Perhaps the clearest and best example of rough exposed rock standing out from the surface can be found on Mabel’s wicked side (her right, our left). For reasons best known to herself she absolutely, steadfastly, refused to entertain the idea of her ample rough terrain being worked in any way shape or form, despite my best efforts as I hurled every tool in my arsenal at it. Whereas when carving Top ‘O th’ World I had to painstakingly nibble my way to the naturally bulging surface by picking away at it in a way that I’m sure would have made an archaeologist proud. The oddly angular formations, created by the granite as it was literally torn apart by the iron grip of the marble enveloping it, could only be generated by the immense pressures that splitting the giant slab brought to bear on it. Left to itself granite will split along its own fault lines and embedded weaknesses and will generally split to create a smoothish surface. 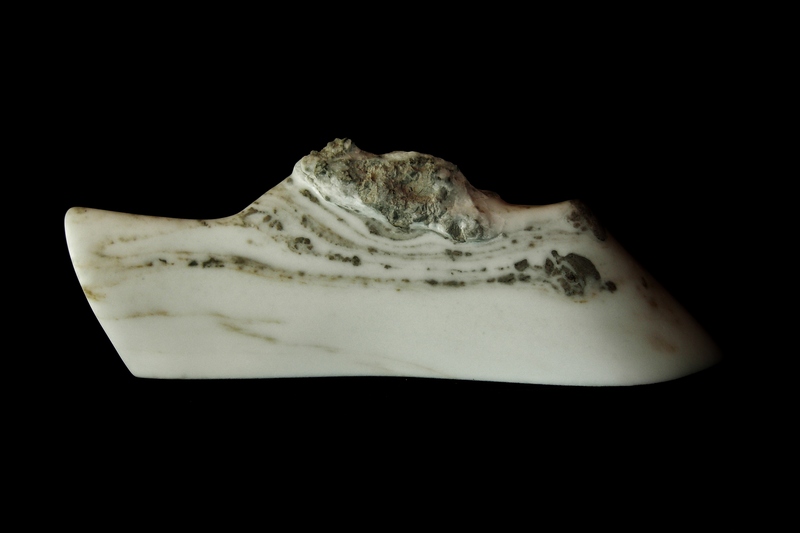 But by splitting this super-hard igneous rock, as it lay trapped within its 35 million year old cloak of marble, the granite had no option than to split the way it did – a formation rarely seen in nature as the circumstances brought to bear in splitting the Maiden Collection’s slab are rarely, if ever, reproduced in the natural environment. And rarely preserved for too long if they do as the erosion process will begin almost immediately due to the consequences of the wear and tear of daily life on our lively planet Earth. This entry was posted in Gallery 1: The Maiden Collection, Gallery of Boats, Gallery of Curvilinear Marble Sculpture, Gallery of Marble Sculpture, Gallery of Sculpture, Gallery of Whimsy and tagged Art, Artist, Aspen, boat, Colorado, contemporary, curvilinear, direct method, fine art, Marble, Martin Cooney, reductionist, Sculpting, sculptor, Sculpture, Woody Creek, Yule marble. Bookmark the permalink.